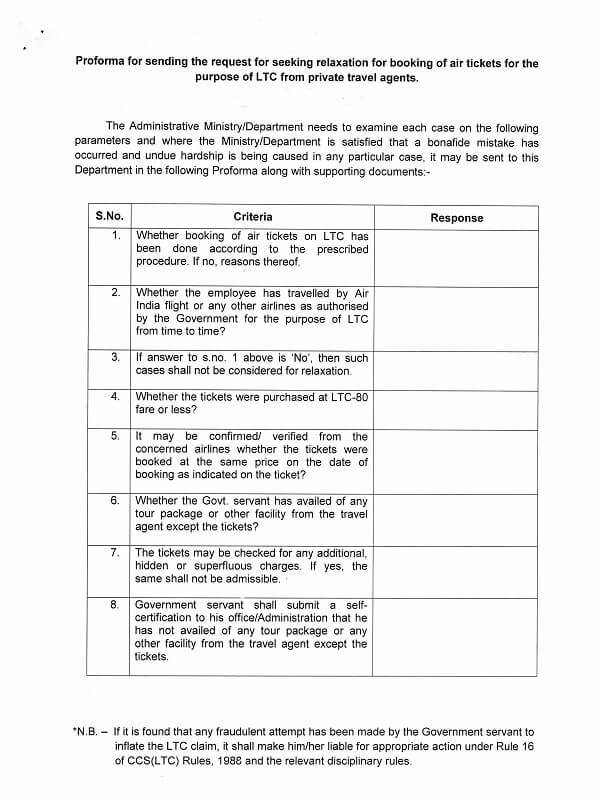 Subject:- Procedure for booking of air-tickets on LTC – compliance of instructions regarding. The undersigned is directed to refer to this Department’s O.M. No. 31011/5/2014-Estt.A-IV dated 24.09.2014, 23.09.2015 and 21.08.2017 on the procedure for booking of air tickets on LTC and to say that as per the extant instructions, whenever a Government servant claims LTC by air, he/she is required to book the air tickets directly from the airlines (Booking counters, website of airlines) or by utilizing the services of the authorized travel agents viz. ‘M/s Balmer Lawrie & Company’, ‘M/s Ashok Travels & Tours’ and ‘IRCTC’ (to the extent IRCTC is authorized as per DoPT O.M. No. 31011/6/2002-Est(A) dated 02.12.2009) while undertaking LTC journey(s). 2. 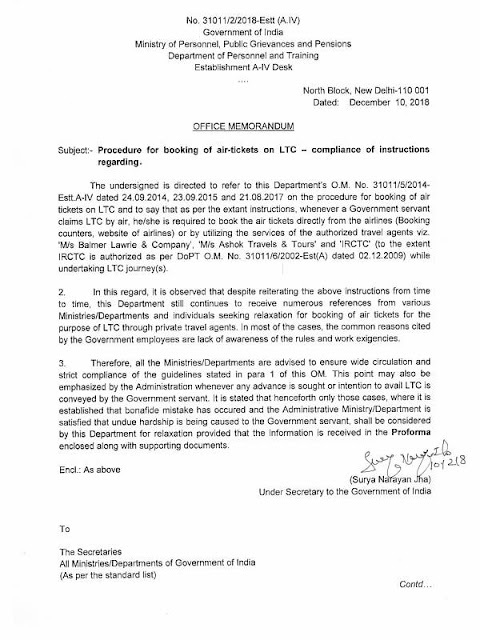 In this regard, it is observed that despite reiterating the above instructions from time to time, this Department still continues to receive numerous references from various Ministries/Departments and individuals seeking relaxation for booking of air tickets for the purpose of LTC through private travel agents. In most of the cases, the common reasons cited by the Government employees are lack of awareness of the rules and work exigencies. 3. Therefore, all the Ministries/Departments are advised to ensure wide circulation and strict compliance of the guidelines stated in para 1 of this OM. This point may also be emphasized by the Administration whenever any advance is sought or intention to avail LTC is conveyed by the Government servant. 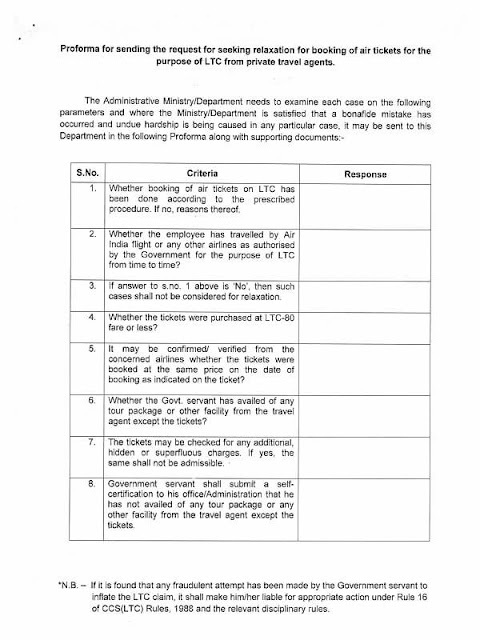 It is stated that henceforth only those cases, where it is established that bonafide mistake has occurred and the Administrative Ministry/Department is satisfied that undue hardship is being caused to the Government servant, shall be considered by this Department for relaxation provided that the information is received in the Proforma enclosed along with supporting documents. 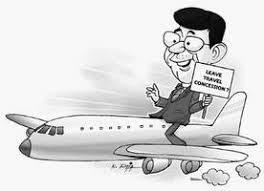 Whether booking of air tickets on LTC has been done according to the prescribed procedure. If no, reasons thereof . Whether the employee has travelled by Air India flight or any other airlines as authorised by the Government for the purpose of LTC from time to time? If answer to s.no. 1 above is 'No', then such cases shall not be considered for relaxation. It may be confirmed/ verified from the concerned airlines whether the tickets were booked at the same price on the date of booking as indicated on the ticket? Whether the Govt. servant has availed of any tour package or other facility from the travel agent except the tickets? Government servant shall submit a self certification to his office/Administration that he has not availed of any tour package or any other facility from the travel agent except the tickets. *N.B. - If it is found that any fraudulent attempt has been made by the Government servant to inflate the LTC claim, it shall make him/her liable for appropriate action under Rule 16 of CCS(LTC) Rules, 1988 and the relevant disciplinary rules.